Turn down your thermostat by 1 degree C. This could save you up to 10% on your heating bill. Turn down the temperature setting of your hot water cylinder thermostat to 60 degrees C. This will be more than hot enough for taking showers, baths and washing dishes. Close your curtains in the evening. They are a valuable form of insulation and can stop extra heat escaping through the window into the cold night air. Electrical devices such as TV and computers consume almost as much electricity when left on standby mode as when switched on. Turn them off if you're not using them right from the power bar. Defrosting your fridge and freezer can help it run more effectively. Also when using the appliance, try not to leave the freezer or refrigerator door ajar longer than required as the cool air will escape, meaning the freezer or refrigerator will have to work even harder to cool the air inside down again when you do close the door. Run a full load in your washing machine and tumble dryer. If this is not possible, choose the economy load, or run it at a lower heat. The same applies to dishwashers. If you're on an off-peak electrical tariff, run your dishwasher/washing machine during the cheaper overnight period. Don't overfill kettles: boil only the amount you need. Dripping taps if left all day can waste as much water as it would take to run a bath. Make sure you firmly close all taps when you're finished with them. Have a shower instead of a bath. An ordinary shower uses less than half of the water that a bath does. Purchase energy efficiency rated items when replacing equipment. Look for the energy efficiency logo and choose the most efficient. If you are replacing your furnace, upgrade to a high efficiency furnace which will deliver the same heat using 20% less fuel than a conventional furnace. Ensure your hot water tank is sufficiently lagged. A lagging jacket will pay for itself in less than a year, and eliminate excessive heat build up in the cupboard. Do not block radiators with furniture or curtains as this prevents heat from radiating outwards into the centre of the room. Solar usage is growing steadily and is an excellent alternative to conventional electricity. Within the last 30 years the technology became 90% cheaper than in the 70's and there are government grants for homeowners. 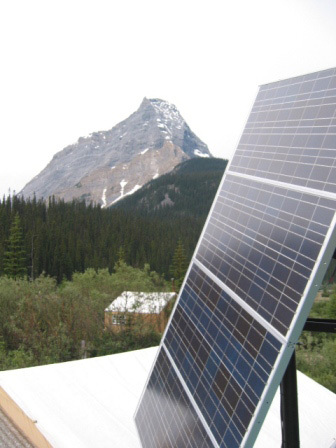 Solar power is clean and inexhaustible (renewable source), silent and maintenance free. Solar water heating: Solar water heating systems gather energy radiated by the sun and convert it into hot water. 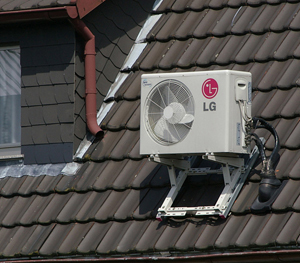 The solar panel fitted on your roof is connected to your existing hot water system (hot water cylinder) and the plumbing system is made up of simple piping which moves the fluid around the system. This will heat water in the hot water cylinder which, in turn, feeds your hot taps. In summer almost all hot water needs are met by a solar system, the rest of the year it pre-heats the water so your water heater only tops up to the required temperature. Photovoltaics (PV): This form of electricity is generated by capturing energy from the sun to operate appliances and lighting. This electricity is used in your home in the same way as the electricity you currently buy from your energy supplier. Solar PV systems are available as roofing products which replace conventional roof tiles and they can be integrated into your roof without changing its shape or style. PV cells have no moving parts or chemical emissions and converting the sun's energy into electricity is an effective way of reducing your daily impact on the environment. The wind energy industry is the fastest growing energy industry worldwide. Although Canada has nearly half of North America's total wind energy resource, it remains largely untapped. Harnessing wind involves converting the power within a moving air mass (wind) into rotating shaft power, which in turn produces electricity. Most wind turbines have 3 blades which face into the wind, the wind spins the blades which turns the shaft, which acts as an electrical generator which produces electricity. Power from the wind is proportional to the wind speed and can result in large changes in the potential electricity output. Most small wind turbines generate direct current (DC) electricity. It is common to combine this system with a diesel generator for use during periods of low wind speed, which gives a greater efficiency and flexibility. Small scale wind power is suitable for homes in remote locations which are not connected to the national grid and where conventional methods of energy supply are expensive or impractical. Turbines ranging from 0.6kW to 50kW can be used to provide electricity generation for individual homes. The height of the turbine varies, but for stand-alone machines they generally range from 6-12 metres. Wind turbines are generally made of steel. The blades are made from glass fibre, reinforced polyester or wood-epoxy. When sighting a wind turbine, it is important to site it as high as possible because wind speed increases with height and in an area free of obstructions e.g. housing or trees. In a typical Canadian home, around 1/3 of the heat produced by the house's central heating system escapes rapidly through the roof, ceilings, walls, windows and doors. Attics should be insulated to a minimum thickness of 150mm (preferably 200mm) with mineral wool insulation. Fibreglass and various recycled paper insulation products also work well. Drafts through windows and doors are signs of a badly insulated house and can be fixed easily with draft proofing, double glazing or secondary glazing. Uninsulated floors can lose as much as 10% of their heat. You can insulate your solid floors below the concrete slab or basement with polystyrene, cellular glass or high density mineral wool. Above the floor is normally insulated with mineral wool or polystyrene. Timber based flooring, such as chipboard would be placed over this. Either way this work should be carried out by a specialist contractor. Up to half of the total heat lost is through the walls of a house that is underinsulated. 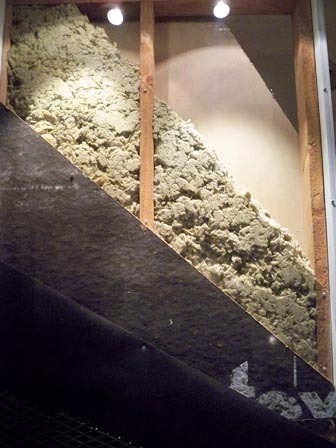 The installation of proper wall insulation can minimize this loss by at least two thirds. There are three main types of external wall: cavity masonry walls; solid masonry walls and lumber-framed walls. Most lumber-framed walls are already well insulated and should need little or no extra insulation. Cavity masonry and solid masonry walls should be insulated whenever possible. Cavity walls are easier and cheaper to insulate than solid walls. If a sunroom or enclosed patio is being added to a house, the existing walls, windows and door separating the sunroom from the house should be retained. The separating walls should be insulated, if possible, as if they were external walls. If the openings (windows and doors) in the separating walls are enlarged, they must be double glazed and draft proofed. Poorly insulated windows account for up to 20% of heat loss in the average home. By making your home's windows energy efficient, you will stop heat escaping and reduce wasted energy. Double glazing is Canada's most popular energy saving measure. It creates an insulating barrier by trapping air in the gap between the 2 panes of glass which reduces noise, condensation and cuts heat loss by 50%. The key to reducing heat loss is the width of the air space between the 2 panes of glass, the wider the gap the better the insulation, although anything above 20mm provides little additional energy saving. In new homes high-performance double glazing has become standard. Good quality secondary glazing is cheaper than new double glazing. Windows with wood or vinyl frames generally perform better than metal framed windows. Vinyl window frames require less maintenance than lumber, which has the requirement to be painted regularly. These both perform better than metal framed windows. Aside from the more obvious insulation properties, double glazing your windows and doors makes them difficult to break in to, providing a deterrent for criminals. In most houses built after 1930 the external walls are made of a sandwich of 2 layers with a relatively small air gap or 'cavity' between them. Insulating walls which contain cavities is straightforward. The insulation is applied from the outside through small holes in the outer wall. The work usually takes about a day and it can be done at any time and although the work is noisy and creates a lot of dust, the occupants can stay in the house during the installation if they so wish. Cavity wall insulation can reduce heat loss through walls by up to 60%, saving you up to 35% on annual fuel bills. The suitability of a wall for filling depends on the exposure of the wall to direct rain, the types of materials used, and the type of insulation material. 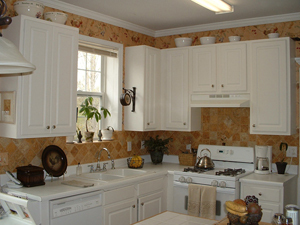 Lumber-framed walls are generally well insulated and must not be cavity filled. Concrete lintels and cills that extend across the cavity (thermal bridges) may need to be insulated internally to avoid the risk of internal surface condensation. The most common types of cavity wall insulation for use in existing dwellings are: polystyrene beads; blown mineral fibre; or granules of urea formaldehyde foam. Blown mineral fibre is made up of strands of mineral wool or fibreglass that are injected into the cavity through a compressed air application. Polystyrene beads are either provided loose or in a sticky, light resin to allow them to adhere to each other and these are injected into the cavity. Urea formaldehyde foam is applied within the cavity by injection while simultaneously blending chemical components so that the foam expands and fills the cavity. In semi-detached or townhouse properties you may require a barrier to be inserted into the cavity to prevent insulation material going into next door's cavity. This entails drilling a large hole, or removing a brick at the top and bottom of the boundary line. Before the insulation material is injected a series of injection holes will be drilled into the cavity. Depending on size, some properties will require well in excess of 100 holes. These holes are normally between 12-26mm in diameter and are drilled through a mortar joint. This has the least impact on the bricks and is easier when completing the finishing process. Doors and windows which do not fit well and gaps set around skirtings and attic hatches are all leading sources of heat loss. Draft proofing doors and windows is relatively inexpensive and simple to install, but could help save dollars on fuel bills, while increasing the comfort of your home. There are three primary types of draft proofing for windows. Silicone O strip is available in a range of sizes and is glued into position with a silicone adhesive. Neoprene blade or fin seals, which are recommended for sealing casement windows, wooden doors, and some sliding doors and windows. Brush pile draft proofing, available in a form which is self-adhesive or bonded to a carrier strip generally made of plastic. 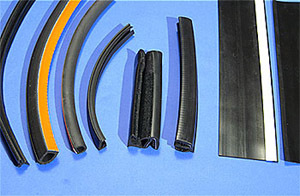 A number of different types of seals are readily available including rubber seals, nylon brush, and sheathed foam seals. These types of seals must be fitted with a primary compression of 3mm to allow for movement of the components in different temperatures and humidity levels. Threshold seals are generally manufactured from aluminum and integrate flexible forms of weather stripping. Special seals should be applied where level thresholds are needed to permit ramp and wheelchair access. Both sides and tops of your door frame should have draft strips fitted, while the bottom edge should be fitted with a door brush. Mailboxes should be fitted with an inside seal which will not affect postal deliveries. The hatch to your attic space should also have draft proofing fitted. This will stop warm moist air escaping into the roof space, which could result in condensation and potential mould formation. To prevent drafts lifting the attic hatch, two catches or bolts should be fitted as part of the job. In all cases, when draft proofing has been completed it is important that you can still operate all doors and windows as before. There are many Canadian homes which are fitted with different types of heating radiators. As the radiator heats up, it also transfers its heat to the wall behind it. This heat is then transmitted to the outside section the wall where it leaches to the outside. 70% of the heat generated in the rear part of a radiator is lost in this fashion. Radiator insulation is designed to trap still air (which is an excellent insulator) between the walls and the radiators preventing this major heat loss into and through walls. This will distribute the heat output otherwise lost partly back to the radiator and partly back, by convection, into the room where the radiator is located. Cold spots are reduced thereby increasing comfort levels. By fixing a radiator shelf above the radiator (make sure there is enough space between the radiator and the shelf to allow the heat to circulate, about 10 cm), the warm air is deflected back into the centre of the room. 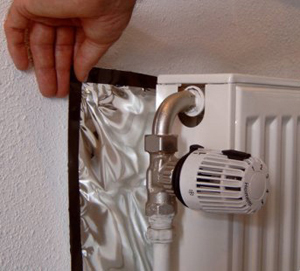 Placing aluminum foil behind all radiators attached to outside walls will help to reflect the heat back into the room. Switching off the water heater when you do not require hot water. 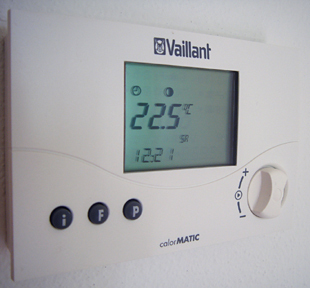 Time switch or programmer controls are the most useful of all heating controls. It turns your hot water and heating on and off automatically at the times you set, saving you energy and money. Room thermostat controls automatically switch your heating off once it reaches your chosen temperature and back on again if it drops below your own comfort level. By investing in a modern and computerized model, you can control the temperature throughout your home at various stages of the day to cut your energy bills considerably. Using hot water cylinder thermostats by reducing the temperature of your stored hot water can reduce energy wastage and save yourself money. Turning the cylinder thermostat down to 60 degrees C as that is more than hot enough. Energy efficient lighting can provide savings of up to ten times the cost of the lamp over its lifetime, even though energy efficient lamps are initially more expensive that conventional ones. Energy efficient lighting can be installed at any time, anywhere. They are particularly cost effective for lighting that is used throughout the night, such as security lighting. You should also consider replacing lighting which is used for more than four hours per day. Energy saving light bulbs can produce lighting using a fraction of the electricity needed for ordinary light bulbs which means they can last up to 12 times longer and go on saving you money year after year. They come in standard bayonet and screw fittings and a variety of shapes and sizes. They don't work with electronic sensors, dimmers and timers, so always check the manufacturer's instructions first. The latest energy saving light bulbs look exactly like ordinary bulbs. Meanwhile "stick" type energy saving light bulbs work best in central positions because they radiate light uniformly. For wall lights, however, you might prefer a "flat" light bulb, which provides more light at top and bottom. When you're walking down the aisles of your local hardware store or supermarket, they may not seem like a bargain, as compact fluorescent bulbs cost more when you get to the register. What you may not know about compact fluorescent bulbs is how much they can save you in the long run. The life of a compact fluorescent bulb is much longer than that of a standard incandescent. Think for a moment about those times you walk into the house, flip the light switch, and see a bright flash and then more darkness. It probably happens more than you like, and this can change. 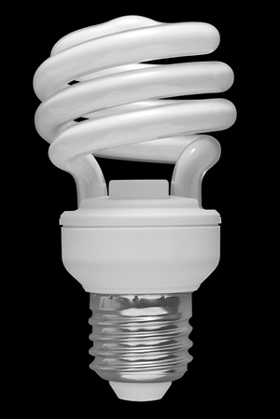 According to estimates, compact fluorescent bulbs last between ten and twenty times longer than incadescents. Sounds nice, doesn't it? Fewer shopping trips and searching through drawers in the dark. And there's an added bonus: less money leaving your wallet. Thought it may not seem that way when you go up to the cash register at your local market, the fact is that a longer-lasting bulb-even one that costs a little more initially-will save you money in the long run. Even with these facts in front of you, the initial expense may seem overwhelming as you multiply the number of bulbs you have in your house by the price of a new compact fluorescent bulb. But there's no reason to change everything at once, especially since it's unlikely that all your bulbs are burned out at the moment. Instead, consider buying one or two at a time and replacing your old bulbs as they burn out. This way you'll save money in the long run, and your wallet won't feel the pressure in the short term. Energy efficient domestic appliances use less electricity and are therefore less expensive to run. As an additional bonus, they produce less atmospheric pollution. Energy efficient appliances can be no more expensive to buy than equivalent appliances that are much less efficient. When buying an appliance, look for the energy label. An energy saving recommended washing machine uses over 30% less energy than the average older model. You can also save energy by washing at lower temperatures (for example washing clothes at 40 degrees C instead of 60 degrees C uses a third less electricity) and by always washing a full load, or using a half-load or economy program instead. Your dishwasher performs approximately 300 cycles per year. An energy efficient one will use approximately 40% less energy than a typical older model: again using a full load or an economy program will save energy. The fridge-freezer is one of the hardest working appliances in your home and energy efficient fridge-freezers use over 60% less energy. Every bag of household and gardening trash thrown away in your garbage can is more than half full of potentially valuable resources. Recycling your trash has many benefits. Most of the things that we throw away are made from natural resources that are running out or that cannot be replaced quickly enough to compensate for the amount that we use. Making products out of recycled materials saves a significant amount of energy. For example, manufacturing aluminum cans from aluminum that has been recycled utilizes nearly 25 times less energy than manufacturing the cans from new solid aluminum. 5 out of 6 glass bottles are thrown in the bin. Aluminium cans take 80 - 100 years to decompose. It is estimated that we use more than 10 billion plastic shopping bags every year. They can take between 10 - 20 years to decompose. Tin cans can take up to 50 years to decompose. For every ton of paper recycled approximately 15 average sized trees can be saved. 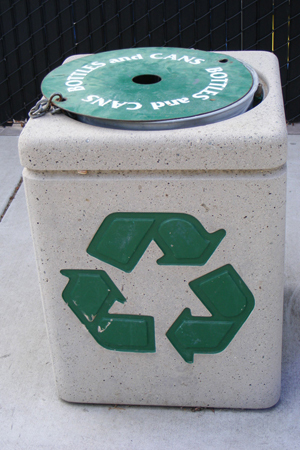 If all the aluminum cans sold in Canada were recycled there would be 10 million fewer trash containers needed. The average Canadian family uses eight trees worth of paper each year. Six million disposable diapers are thrown away each day in Canada.